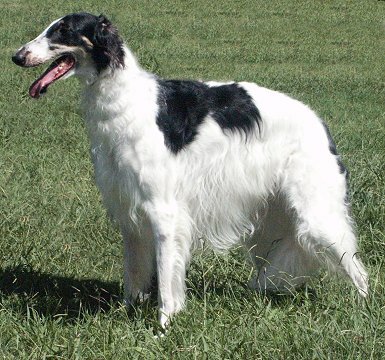 Below are pics of some of the Borzoi that we have placed with other families. 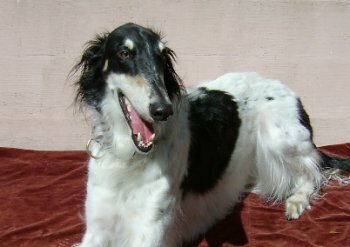 Some have links to either their owners' personal websites, or to another page on this website featuring more pictures. 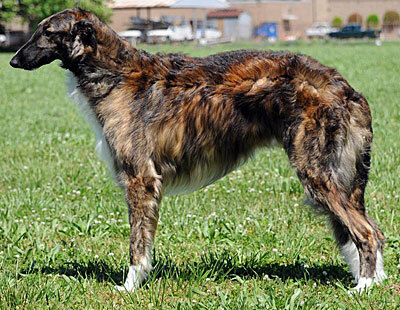 Muzhik is a specialty winner. 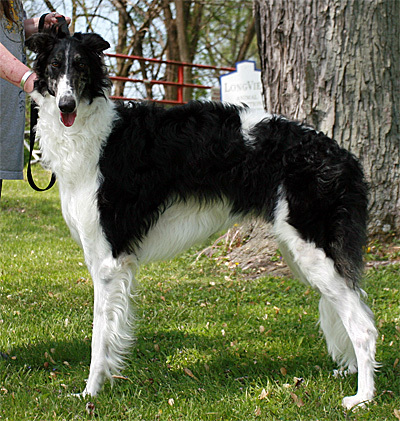 We would have liked to provide pictures of that win as well as candids, but his owner has neglected to send us any. She later broke our verbal contract by not sending us a puppy we had a right to. Never mind that we gave her this sweet boy as well as another. 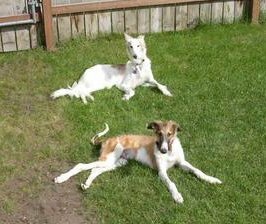 Breeders beware - use written contracts - or people that you thought were good friends will betray you in the end. 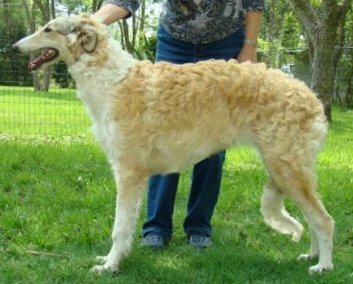 Tethys now lives in OK with the Schatzingers and uncle Merlyn and her cousins. 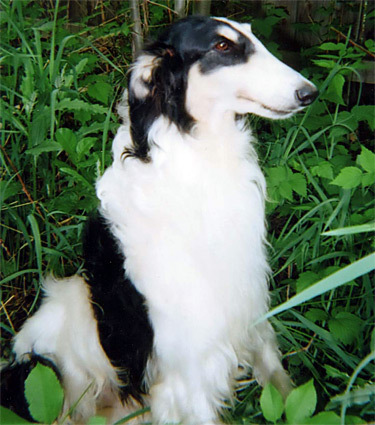 Vlad lives in AR with our friend Rebecca Neal (Afanasii Borzoi). 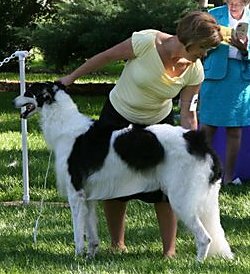 His record includes : Specialty Best Puppy in Sweepstakes, Specialty Best Opp Puppy, Specialty RWD, and Specialty Best of Winners. 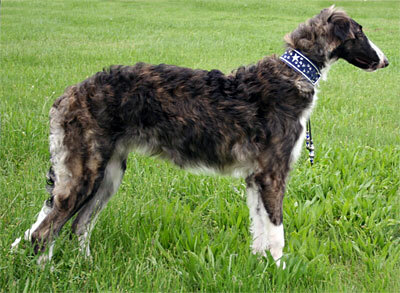 He is a lovely and masculine version of his mother Duri. Pest lives with M.Lucia in Alvin TX. Unfortunately she was not taken out and socialized after her placement, so can be quite shy. Later she escaped her yard and was hit by a motorcycle, badly fracturing her front leg and causing devastating damage to her bite as well. So she never saw the show ring. 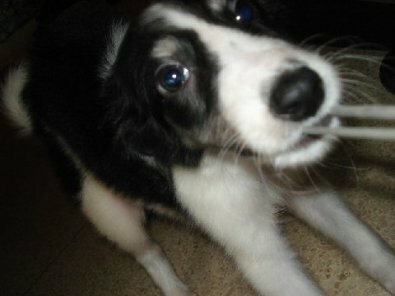 Despite being GIVEN to her owner with a "puppy back agreement," her owner broke the contract and denied us a puppy after listening to malicious gossip from someone who had NEVER even been to our home. Because of these actions, we are sticklers for written contracts, even between what we consider good friends - as she obviously was not. 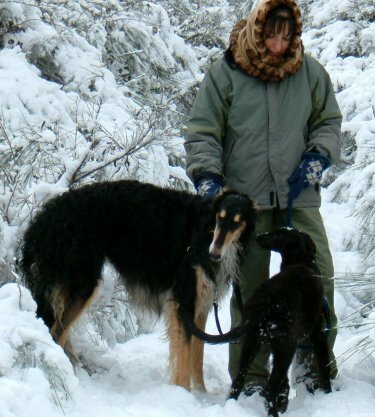 Sasha lives with Sylvia (Wolf Creek Borzoi) in CO. 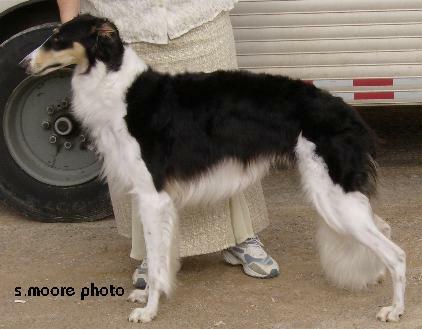 He was won Best Opposite in Sweepstakes at two specialties and a Specialty Reserve Winners Dog. Cognac now lives in OR with the Stern family. Andres lives with Nanya in MO. 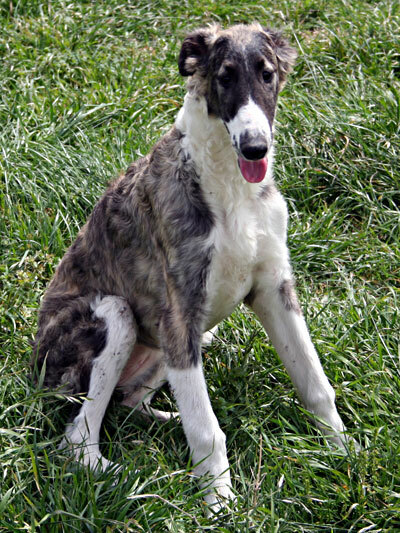 Niko (formerly called "Smudge") lives with the McLaughlin family in Allen, TX. It will be refreshing to have one of our pups living so close by! 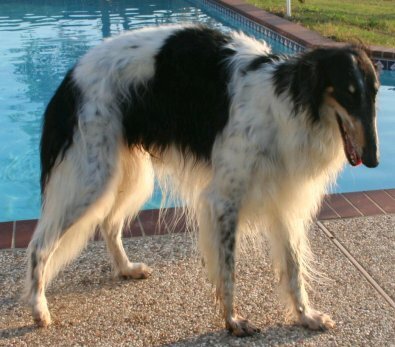 Axl is with the Sisks in Cypress, TX and is a beloved part of their family. Peanut lives with the Lockard family (and Kenny) in CO and will be training in obedience and agility within the local 4-H program. 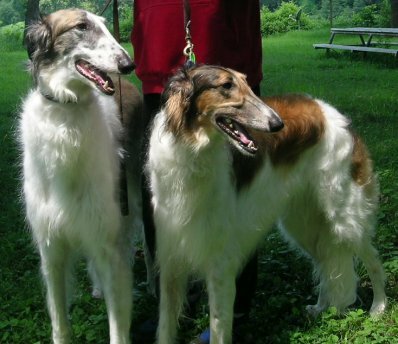 Stella went to live with her co-breeder Margaret Lucia, Wyvern Borzoi, in Alvin and produced a litter for another co-breeder, Sara Whittington, Chataqua Borzoi. Sadly, she passed away from bloat during a severly hot and humid Texas summer while living outside. 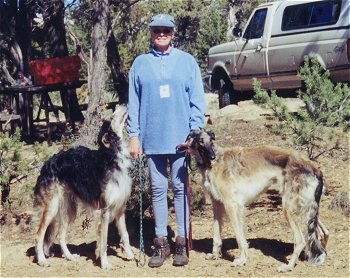 Rosy (pictured on the right) lives in Oklahoma with Kaye Hayes. 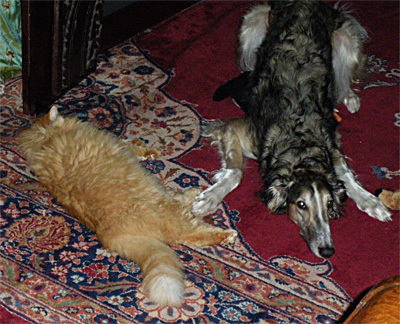 Rohan (pictured with his Silken buddy) lived in Alaska with Danielle. Brrrrr! Sadly lost to bloat while being kenneled. Oksana lives with Jen Boswell in Alabama. We called this handsome fellow Junior when he was here, since he was marked so similarly to daddy Arthur. He is now known as Bailey and lives in Colorado! Molli and Zoe live with the Jurist family. 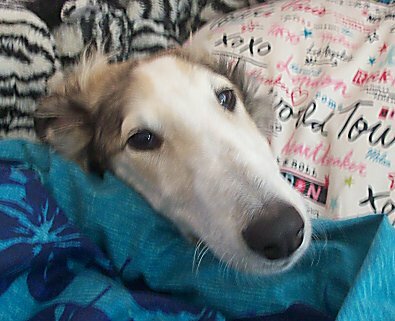 Zoe was lost to cancer in 2012. 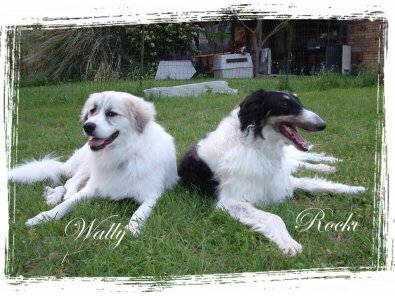 Rocki lives with Terri Pyper in Texas and has several cutie Akita girls to flirt with (once he figured out that prick-eared dogs are 'ok') as well as new bud Wally (pictured) . 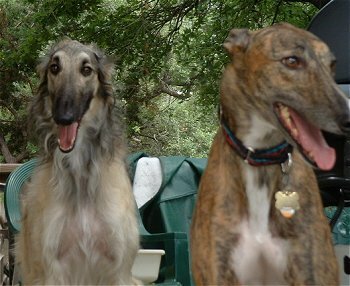 Hess (now known as Tasha) lives with uncle Lance, several Greyhounds and the Selman family in Mesquite. 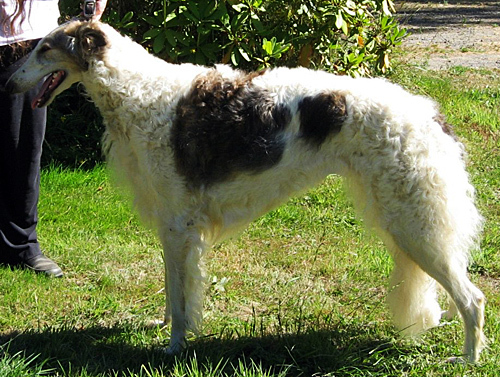 Such a beautiful girl, but her tail was a bit short (right to the hock). She is the princess of the household, and Lance dotes on her as much as her new human parents. She also has a new Iggy friend. We are so happy to have both of these sweethearts in such a loving home! 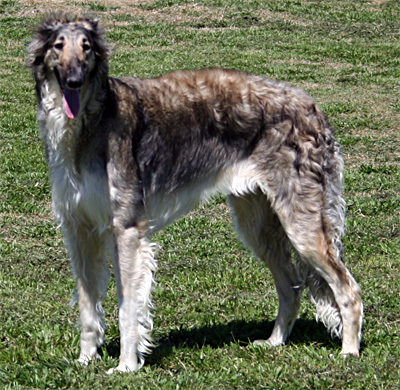 Tere is now known as Arioch and lives with the Teasdales where he has an Irish Setter as a playmate. 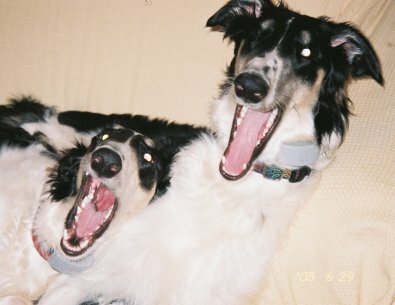 They are a rowdy pair! Quiqo is now known as Sasha and moved to Canada. He passed away in 2012. 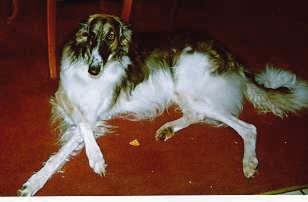 Randi lives in Belgium and has his own little girl to call his own - he also has 2 Borzoi friends, Troika and Tisha. Donya now lives in cool Colorado with Patricia Thompson. Her housemate is paternal half-sibling Rane. She gets to do quite a bit of traveling now! 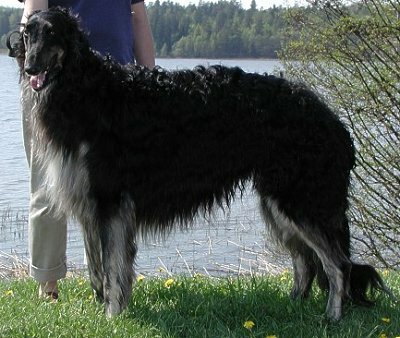 Named for Durandana - reputed to be the Sword of Hector of Troy, later wielded by Count Roland (AKA Orlando) of the Legends of Charlemagne. 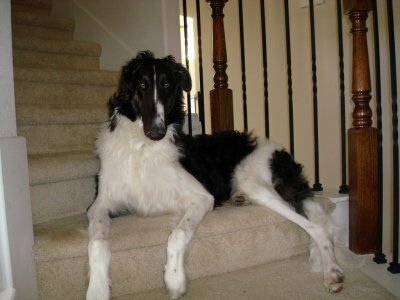 Beautiful Aron now lives with the Snedekers in San Antonio, TX. 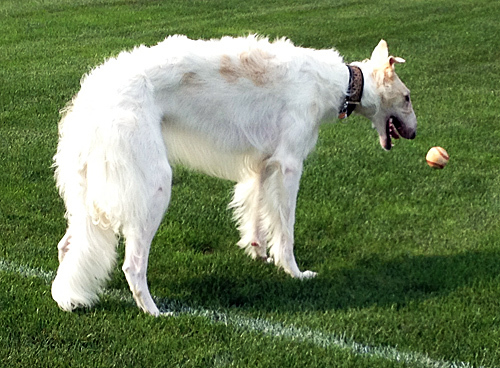 He has a new galpal - Toscana the greyhound - and when not lounging indoors is running laps in the yard. 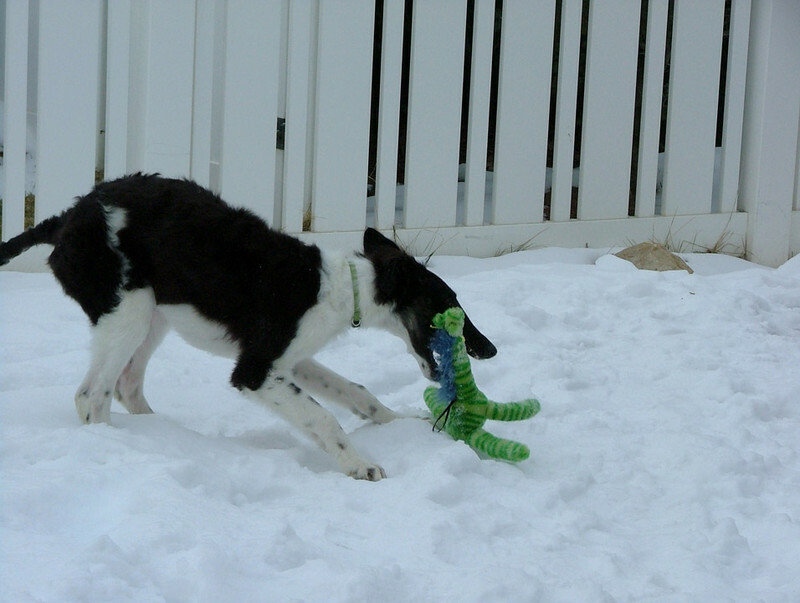 Iago now lives in Sweden (after spending a few months in Spain), where he is much loved by Camilla. Merlyn is spoilt by the Schatzinger's in OK. He gets to go on informal hunting trips in the woods surrounding or near their home and enjoys an occasional dip in a creek or river as well as the occasional flirtation with their she-wolf Foxy. 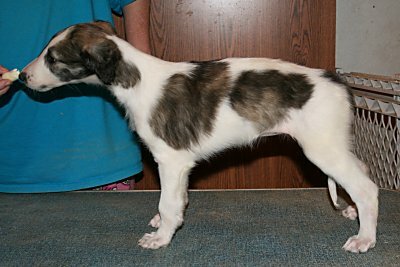 He has also sired a litter of pups for them our of their girl Dani. Lance is a hunky boy, and reminded me quite a bit of his half-brother Freddi. A sweet grinner, he was adopted by the Selmans. A couple months after his arrival there, his niece Hess (now Tasha) came to live there as well. Lance was ever watchful of little Tasha, and I was thrilled to find this wonderful home where he was cherished every day! 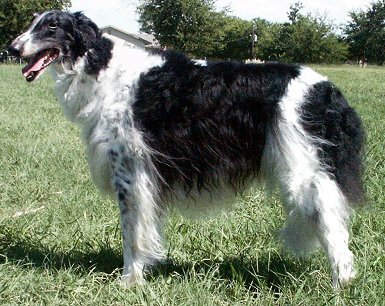 Lance passed away in April 2011 at the age of 13. 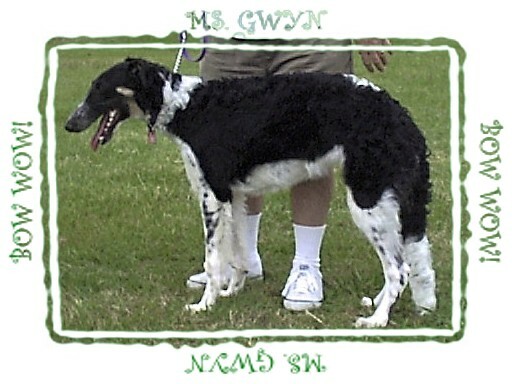 Gwyn was adopted by Steve and Kathy Updegraff. 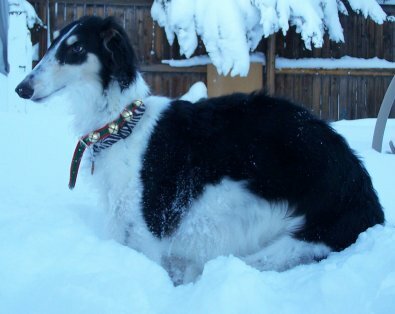 She passed away in the spring of 2010 at the age of 12. 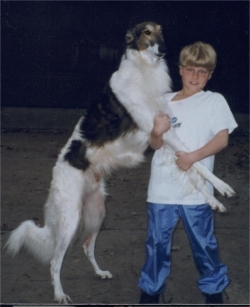 Noble lived with the Sisk family in Cypress, Texas and has performed in the Junior's and Agility rings. 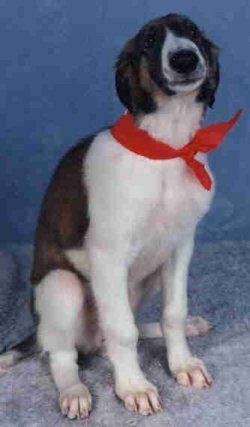 Sadly, Noble passed away in the summer of 2006 after spending over 11 years being an active family member and helping to raise the kids. He is missed greatly. Ginger lived with Joe and Connie Dinapoli in Wallis, TX. 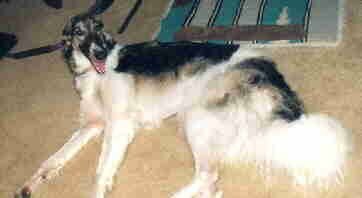 Kodi spent many wonderful years with Richard Olenick of Irving, Texas. 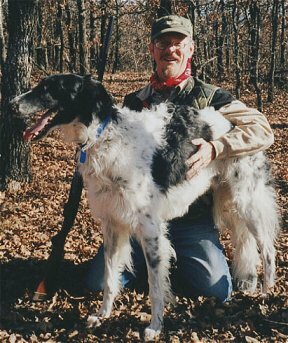 He got to go on sabbatical with Richard and the Borzoi girls he shared his home with - in Colorado! 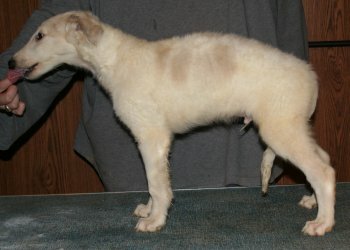 He passed away at over 12 years of age. Kyrie, her name changed to Brandy, lived with Wayne and Joyce Hargraves. She passed quietly in her sleep at the age of 10 years.